On a rainy weekend at home, you decide things are slow, why not search for that futon you’ve been putting off on buying. You fire up your computer and search for futon stores which come up with a few interesting prospects. As you make your way around each site, you notice the futon frames are put into certain categories: wood, metal, traditional, contemporary, size, etc. You’re surfing around, grab your coffee, and sit down to shop some more while getting excited on all the different possibilities. You glance at the clock and was shocked to see you just spent an hour online! A futon frame is just a few pieces of wood put together to hold a mattress, right? Well maybe the one you remember at the dorm was certainly that way. However, futon manufacturers have been working for past many years to change this pre-conception of consumers by making styles that are appealing and of high quality so it won’t be an embarrassment in your home. Using creative talent and innovative design applications, futon frames now come in a wide variety of styles and materials. If you want something better than a low end futon, you can find high quality frames made with thick solid wood construction, beautiful stained finish, and fine luxury grade details. Your futon can be a showcase in your room and not something hidden out of the way only to make its existence known on those rare occasions. 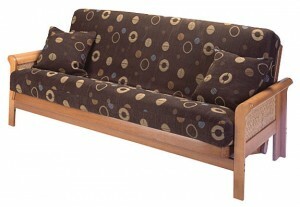 Stay tune for more upcoming articles on futon frames…. « Futon in a Box – All in One Solution?